Fresh Frozen E3Live with an added Brain Support extract! E3Live® + BrainON® is 100% guaranteed. When defrosted, E3Live® + BrainON® must be kept cold and refrigerated. Shelf life in the refrigerator is 7-10 days. 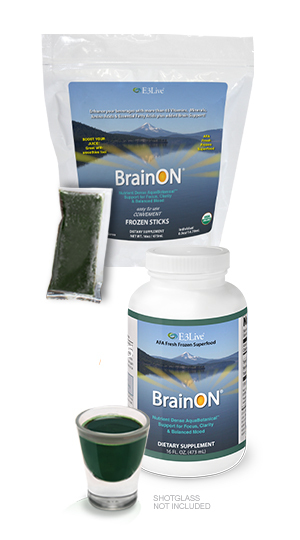 Organic, liquid fresh-frozen AFA algae (Aphanizomenon flos-aquae) with BrainON®, an organic AFA extract of Phenylethylamine (PEA). To ensure E3Live® + BrainON® arrives in its freshest state, we ship in quantities of 6 or more — we've found a minimum of 6 bottles keeps your E3Live® + BrainON® optimally cold during transit to your door. Makes me feel brighter and sharper. Things seem clearer and more focused. It’s amazing stuff! If you have been diligently searching for a supplement that actually helps to make your day a little bit brighter, you have finally found it! 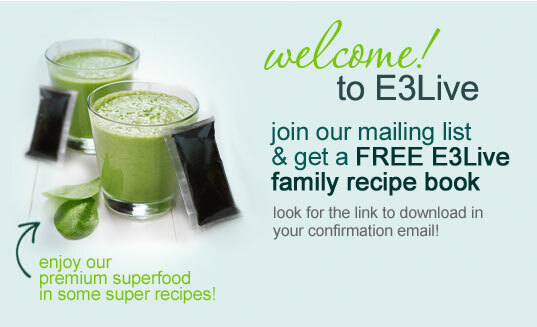 E3Live with BrainOn has what it takes to help give you that extra energy that gets me focused on school and work! I take this in the mornings and feel energized throughout the day! Highly recommended. I love the E3 live product. It make me feel great, provides energy and vitality. I also sleep better! LOVE it. Seriously, I first tried this in December, 2011 and rushed back for more when it ran out. It's really true what they say about the mood elevation and lifting of brain fog. This is our absolute favorite. We actually prefer the flavor of the (unflavored) to the (flavored). This is a great product. It gives my whole family energy. We use it daily along with Brain-On Supreme when extra focus is required. The E3LiveBrainOn does just that, it turns your brain on. I find myself smiling alot now. I feel more alert, happier, and enjoying foods fresh from the garden. If I had to chose between a multivitamin & E3Live BrainOn. I would choose the BrainOn.